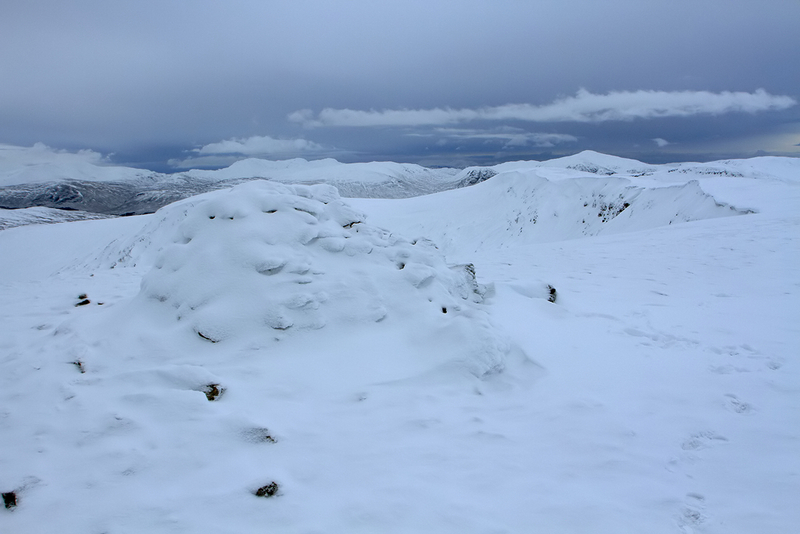 Meall Buidhe Quickie. By my standards anyway! I had friends from Stafford staying up in Skye for a week but I was unable to get up and meet with them last w/e. I got a message from them saying they were stopping in Killin for a few days on their way back so there was an opportunity to meet up. I had hoped we could get a walk together on the Sunday but the forecast was not that great plus Rich had blistered his heel while walking on Skye. 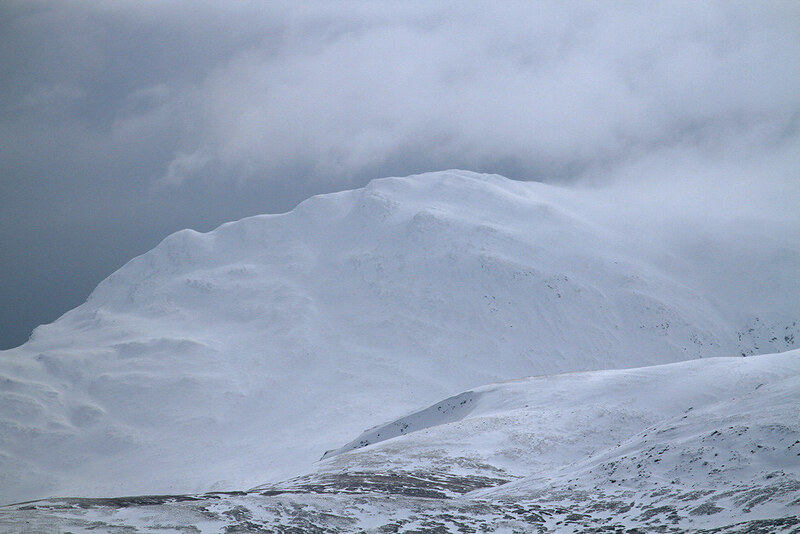 So the plan was to meet on Saturday afternoon when they arrived in Killin which gave me time to get a walk in beforehand. MWIS was indicating a few hours of fair weather in the morning before rain and snow moved in around midday so I opted for a quick walk up Meall Buidhe which I had last done way back in summer 99. I left Irvine at daft o’clock to make sure I beat the incoming weather front. 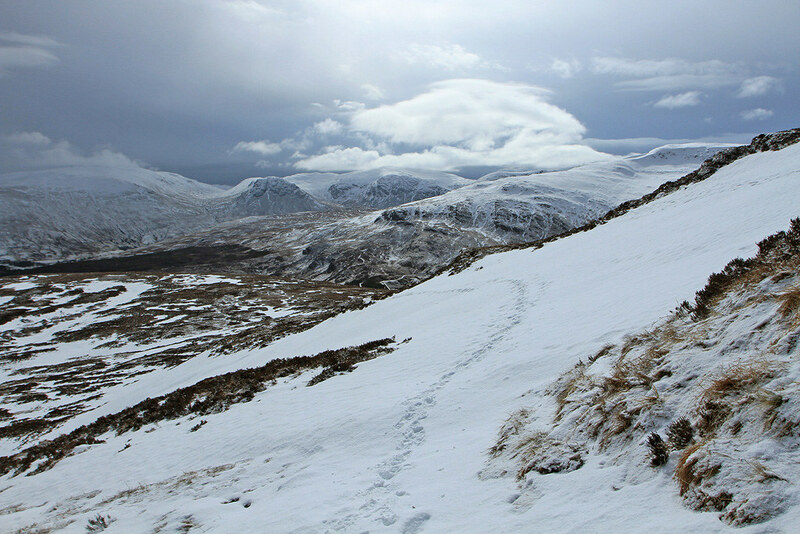 As I arrived in Killin there was fresh snowfall right down to road level and the temp was hovering around -2, so I thought it better to head up to Fearnan and head down Glen Lyon from there rather than risk going up and over by the old Lawers Visitor Centre. 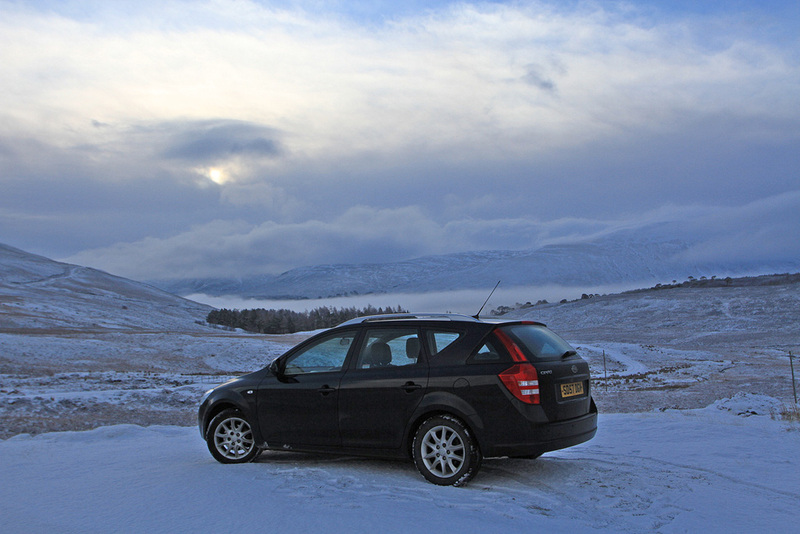 A fair bit of mist and ice on the road slowed progress and as I got further up the glen a fresh layer of snow was covering the road but things were starting to look rather nice as I neared Loch an Daimh around 7.30am. It was -3 and not a breath of wind to be felt had me eagerly getting ready for the off. Cloud was building in the East already. 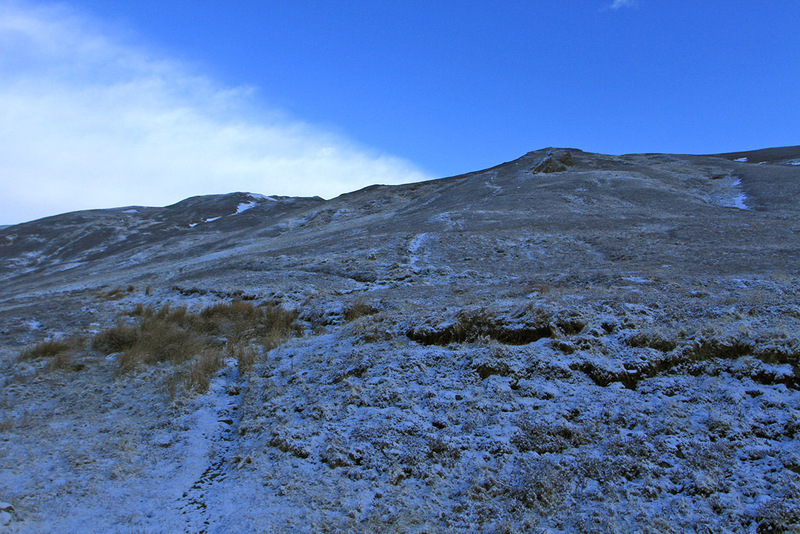 The path heading up and blue sky beckoning me on. 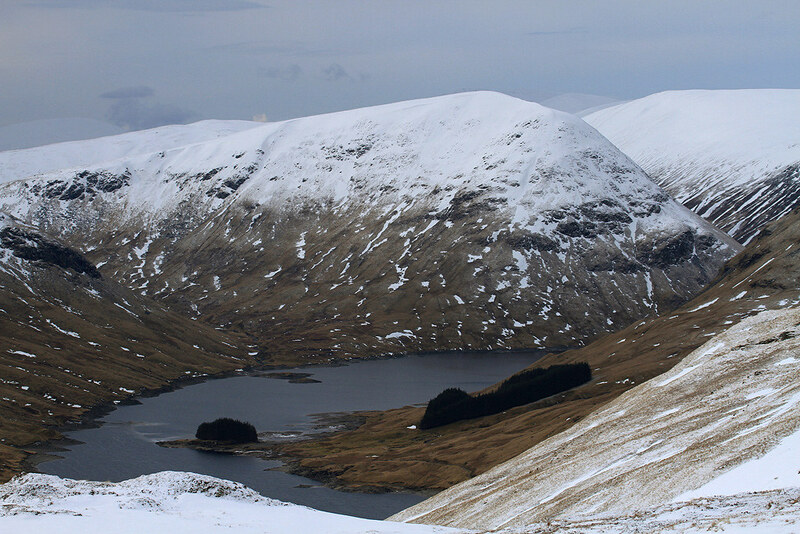 Looking across Loch an Daimh to Sron Chona Choirein. The normally boggy ground was nicely frozen and had a dusting of fresh snow so the walking was nice and easy and it was still eerily quiet with no wind. Looking down the loch to Sorn a’ Choire Chnapanaich. 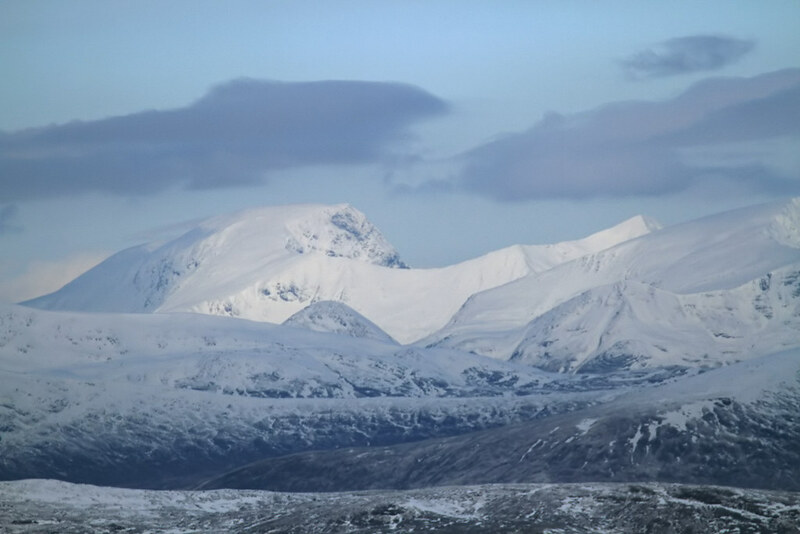 Dramatic views to the East. Still chasing the blue sky. 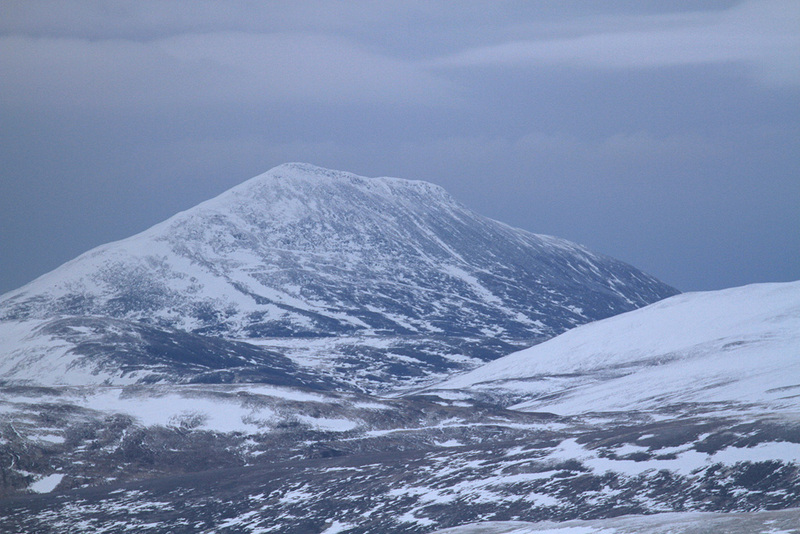 Meall a’ Phuill comes in to view. 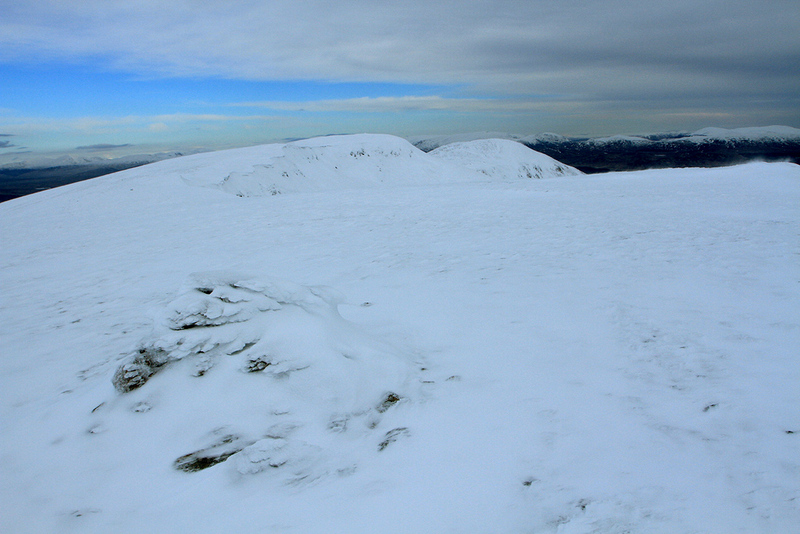 I was now walking on nice firm snow with a dusting of fresher stuff on top. 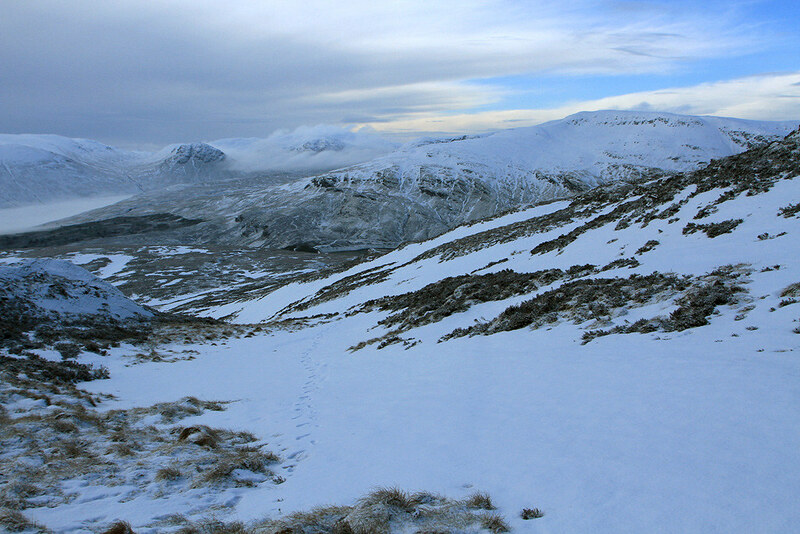 The fresh snow was giving enough bite underfoot so the crampons were not going to be needed today. I was also thinking I was not going to catch up with the blue sky as the cloud from the east was steadily pushing its way west. Cloud cover pushing out the clear sky. 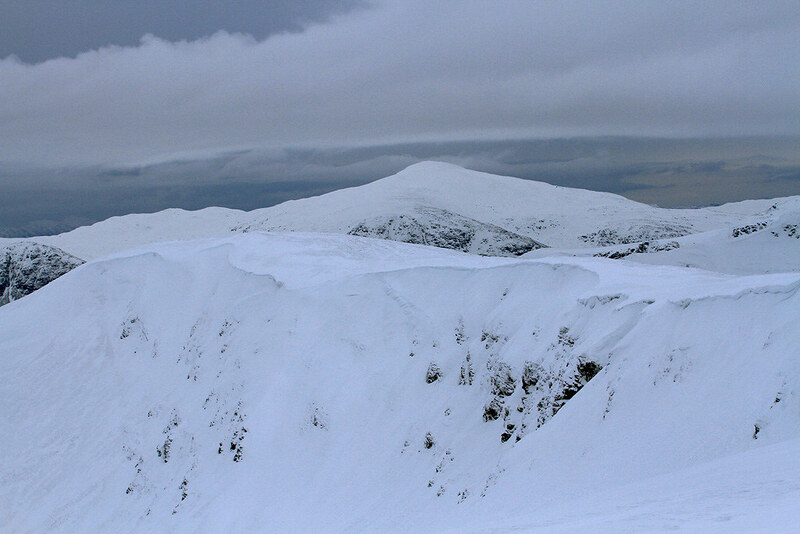 Summit of Meall a’ Phuill with Stuchd an Lochain behind. 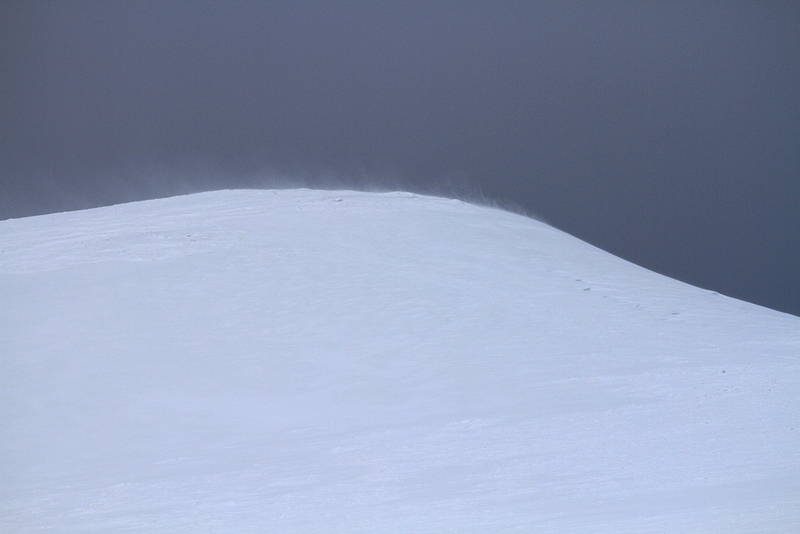 The wind was starting to pick up now I was on the summit ridge and there was a bit of spindrift being picked up. 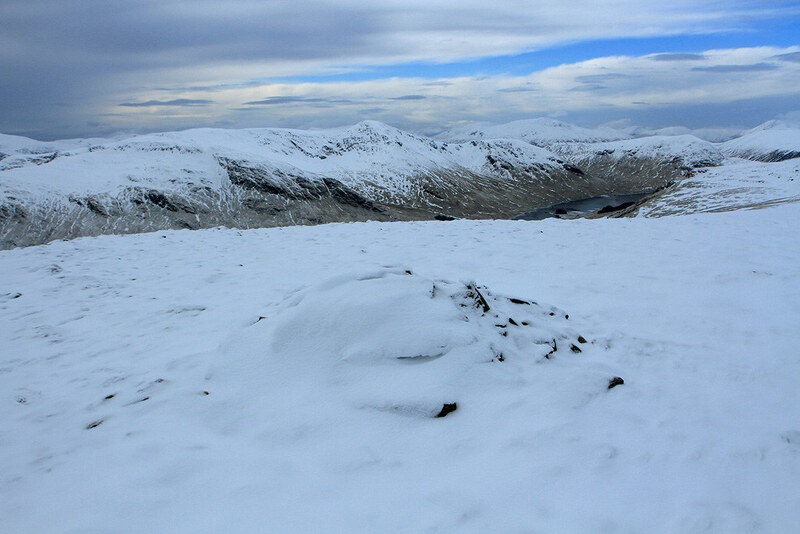 Looking along the ridge line to the summit of Meall Buidhe. 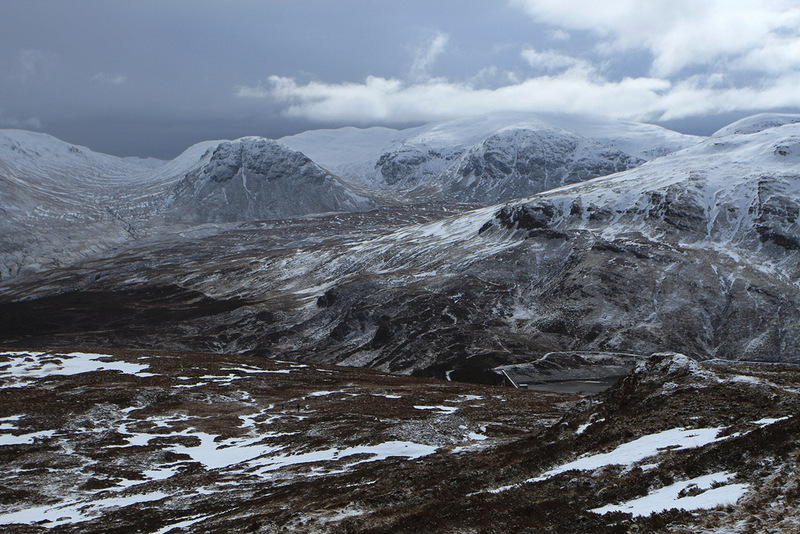 The mountains of Glen Coe were getting the best of the weather. 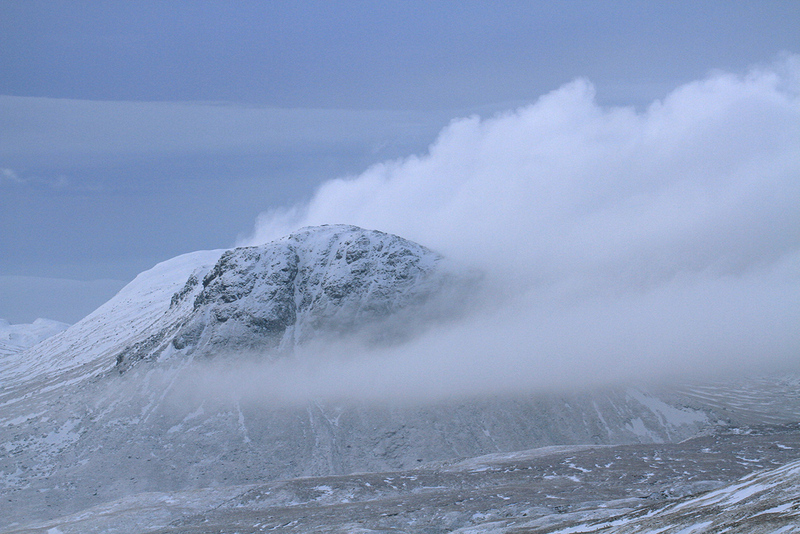 Ben Nevis was enjoying the weather as well. 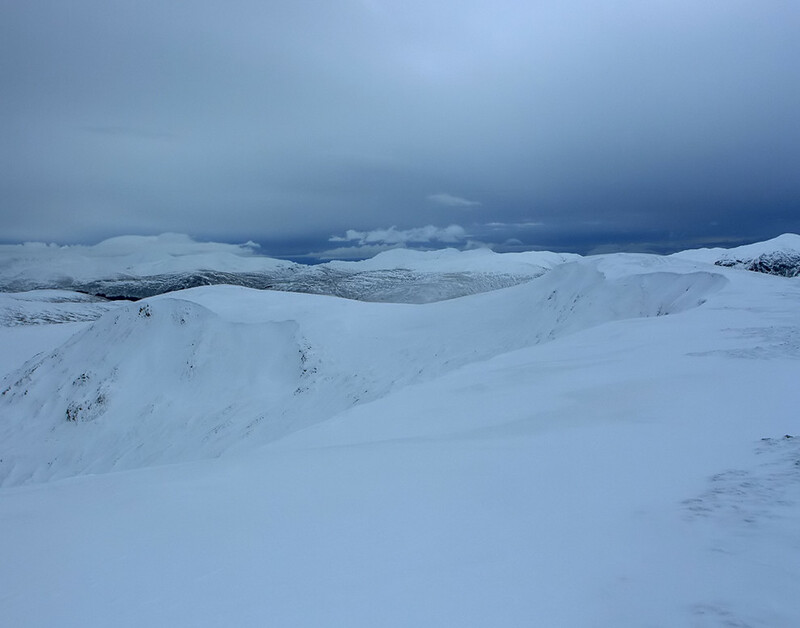 An easy 15min walk to the summit of Meall Buidhe. 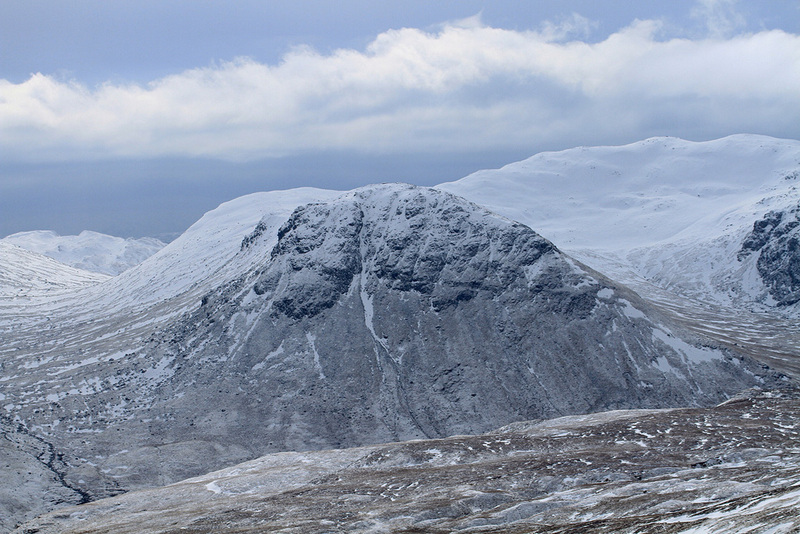 Back to Meall a’ Phuill. 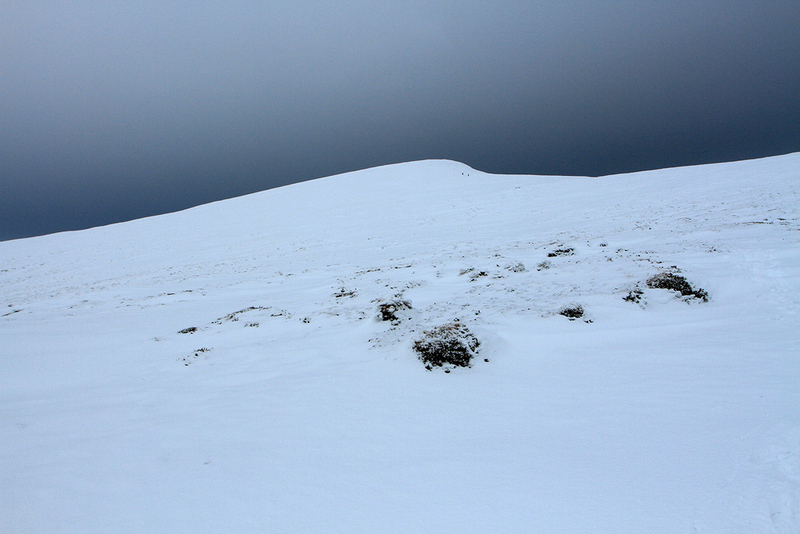 As I was walking along the ridge the wind died away and it was eerily quiet again. Phoned my friends and they had not even left Skye yet so I had plenty of time for a bit of loafing if the weather was going to hold. 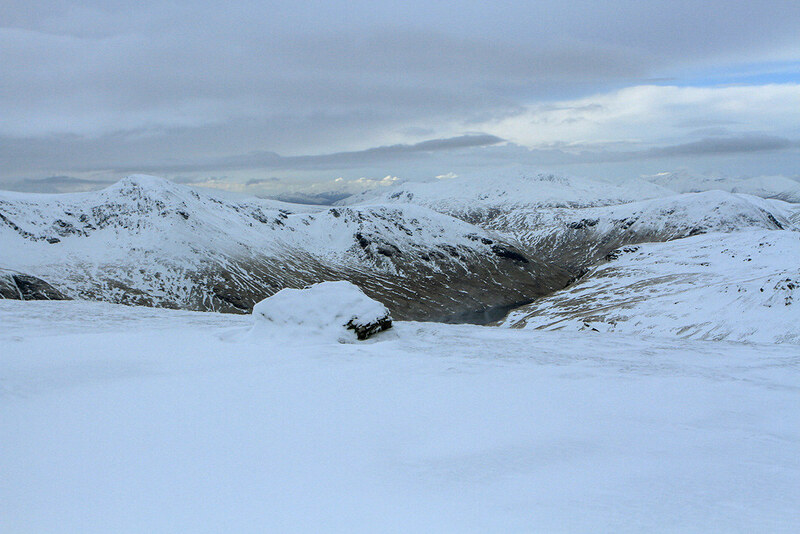 The summit was catching the wind and it was a bit cold but bearable enough to spend a fair while loafing about and taking photos . 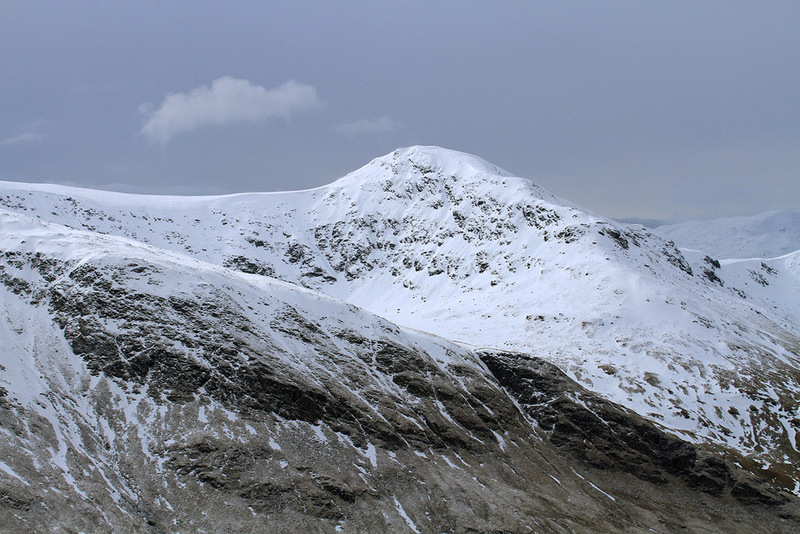 Garbh Mheall. I should have walked over while I was here. 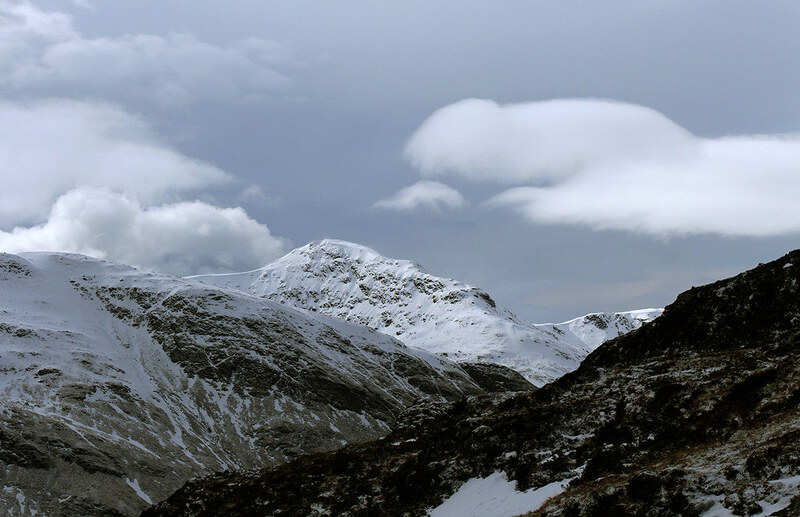 Zoom over to Meall nan Tarmachan. 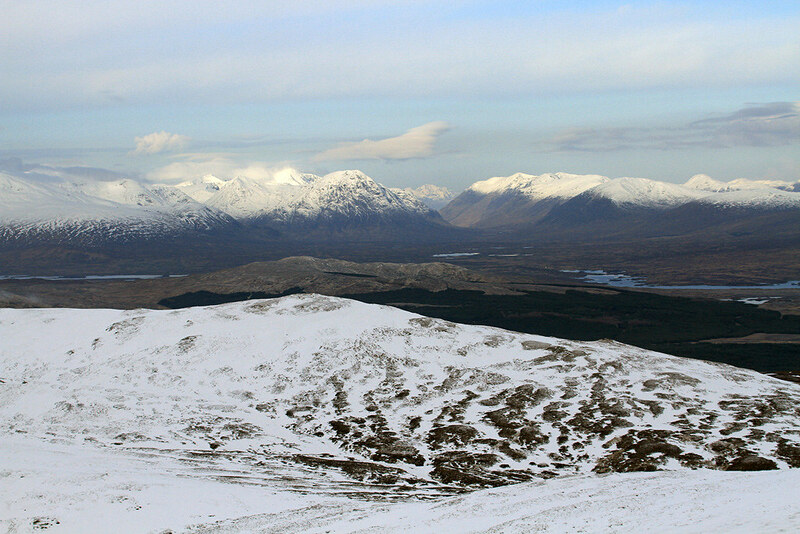 Across Rannoch Moor to Glen Coe. 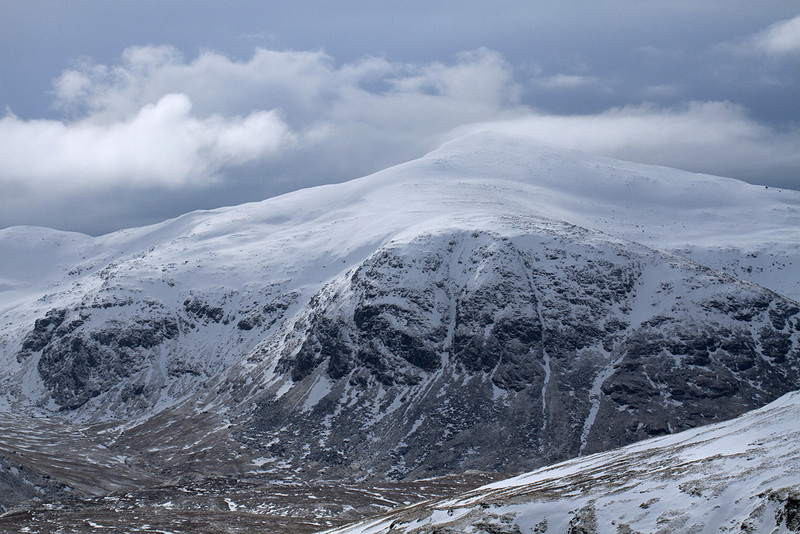 Zoom across Meall a’ Phuill to Meall Ghaordaidh. After sufficient loafing time I turned and headed back as I could see the weather moving in. A phone call from my bruv in Fife a while earlier informed me it had been heavy rain there for the last 2hrs so it was defo heading my way. 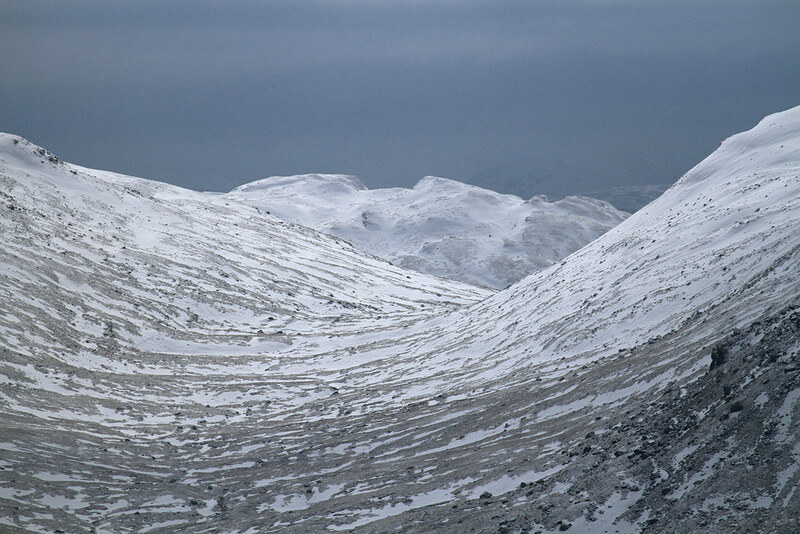 Looking s/w towards Beinn Mhanach. 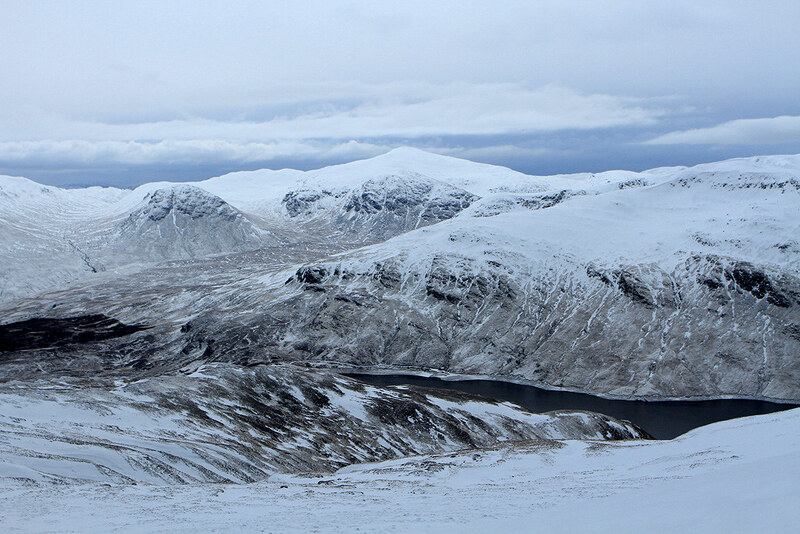 A final look down Glas Choire. 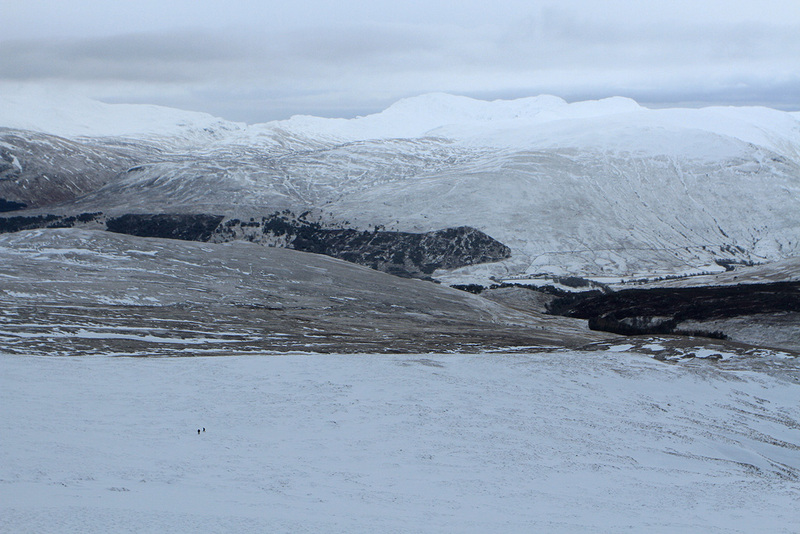 As I made my way down from Meall a’ Phuill I spotted 2 walkers on their way up. The cloud thinned a bit and gave some nice light on my descent. 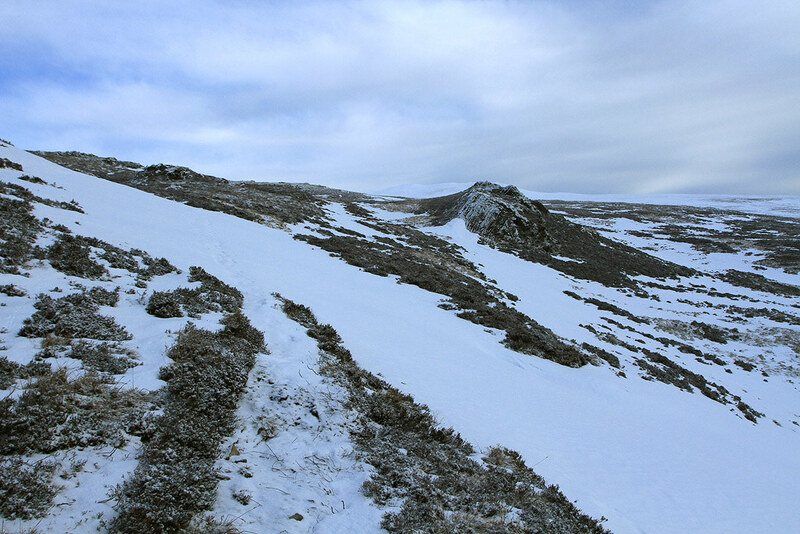 The 2 walkers making their ascent. 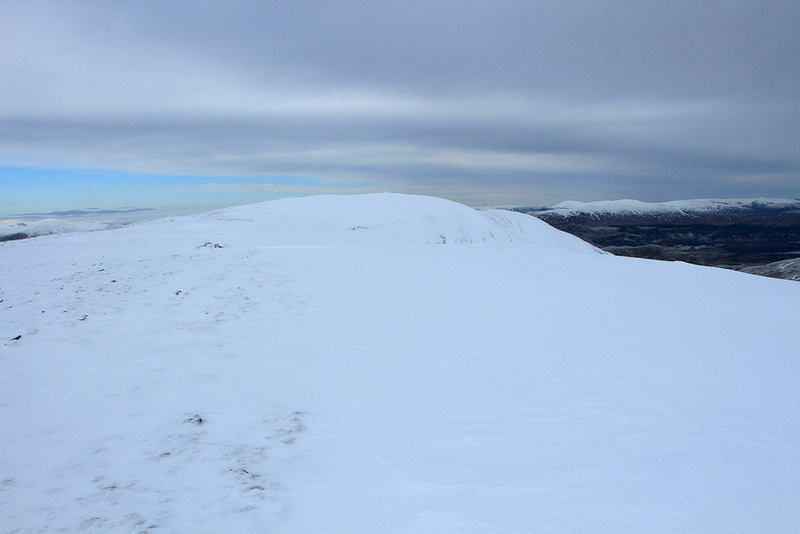 I was glad to get lower down out the wind which was on the increase on the ridge. It was still relatively calm lower down and I stopped to get a few photos before the cloud thickened and I lost the light. 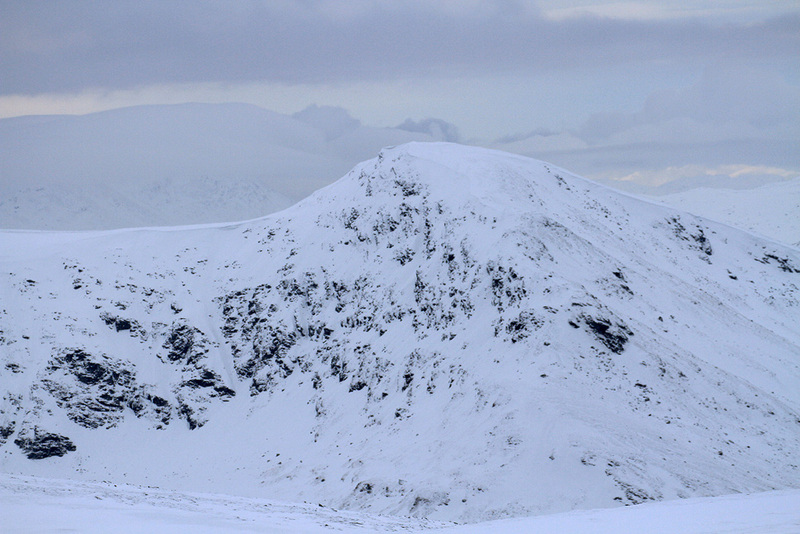 Zoom to Meall a’ Phuill as the spindrift increases with the wind. Wishing I was on Stuchd an Lochain. 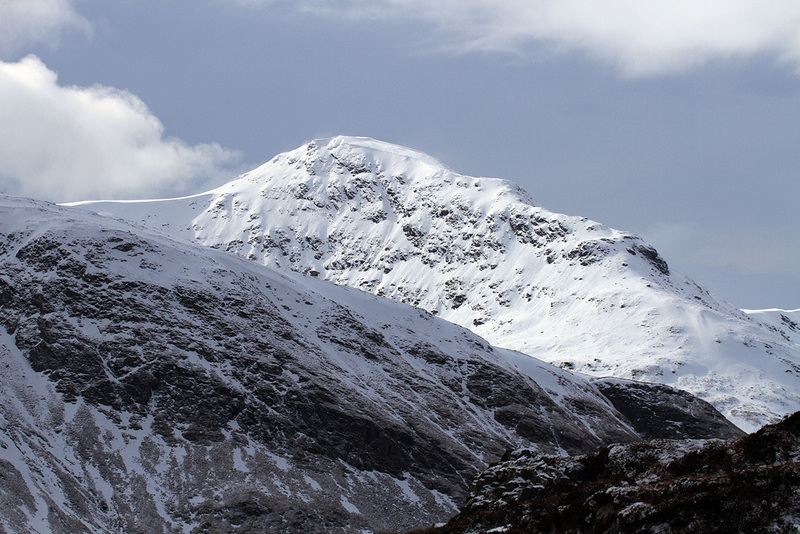 Creag na Caillich and Meall Dhuin Croisg. 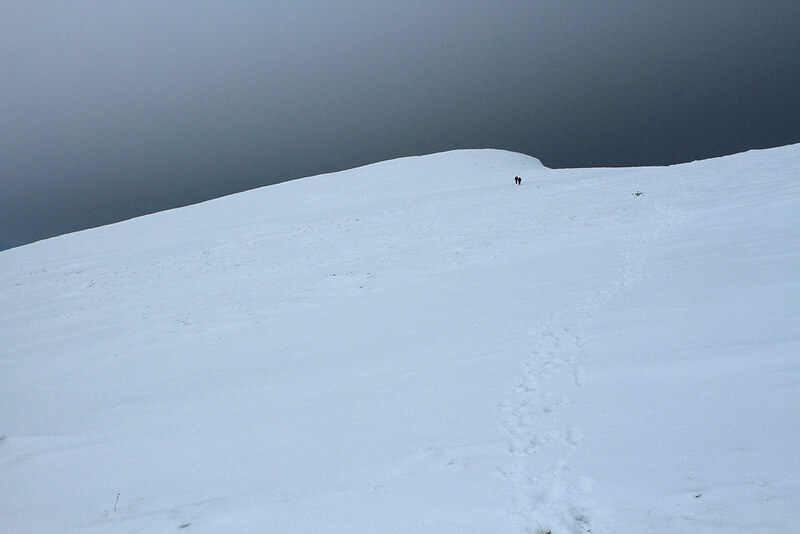 It was now an easy descent in the softening snow. My eyes kept focusing on Stuchd an Lochain. I met 3 pairs of other walkers heading up as I made my way down. 2 of them had no sign of ice axe’s on their packs which is a really worrying sign when the mountains are still in full on winter conditions. Although they would get away with it today they may not be so lucky in the future and it’s always better to have and not need as to need and not have. 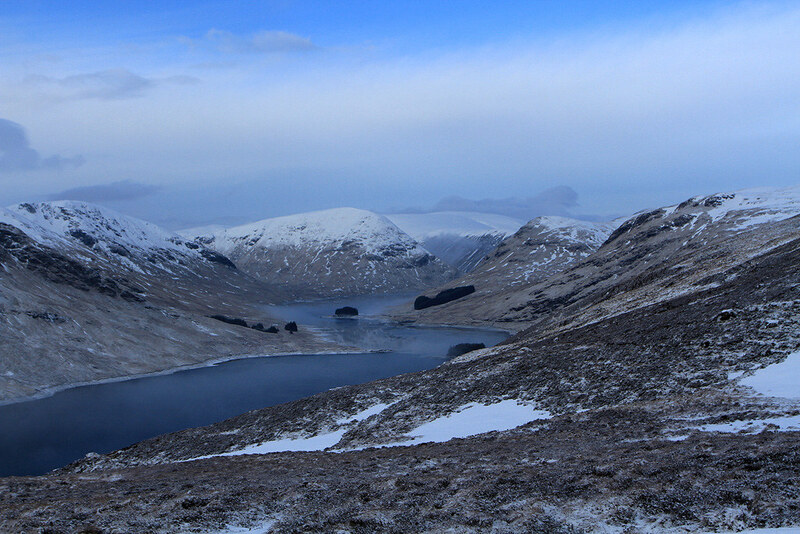 Final look out over Lochan an Daimh. 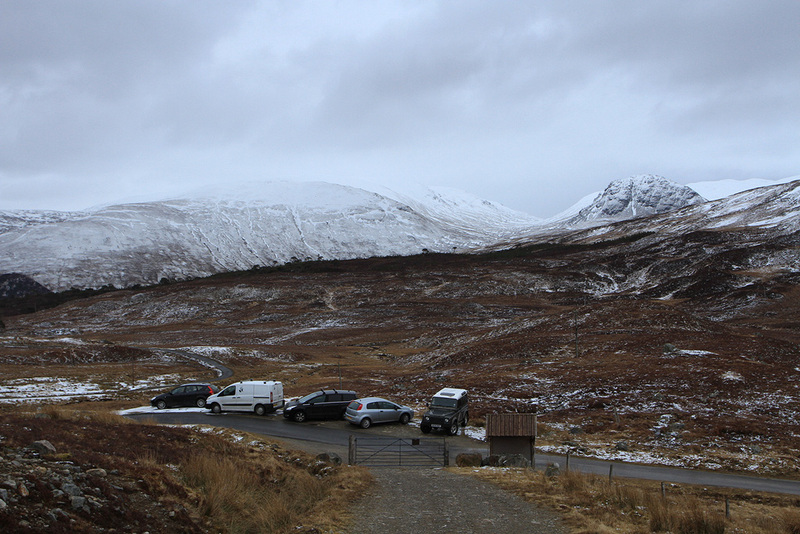 As I reached the parking area the first flakes of snow started to fall. 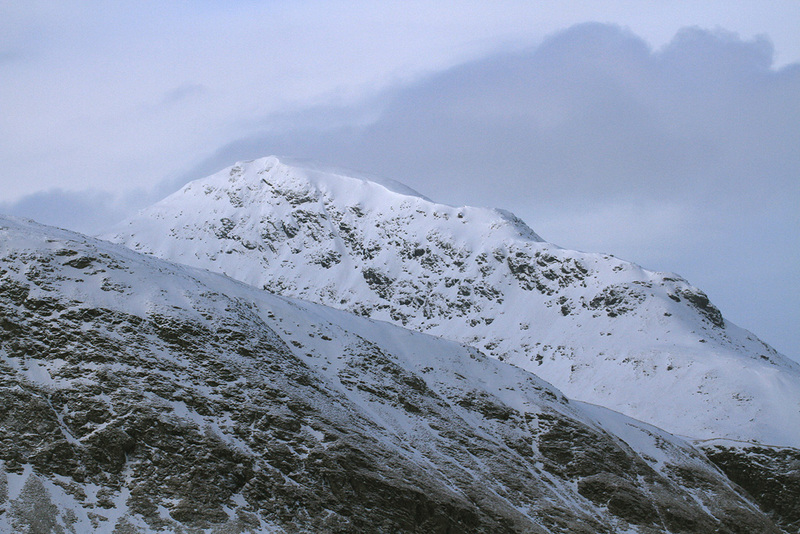 Another Munro with a boring reputation but rather nice in its winter coat I think. 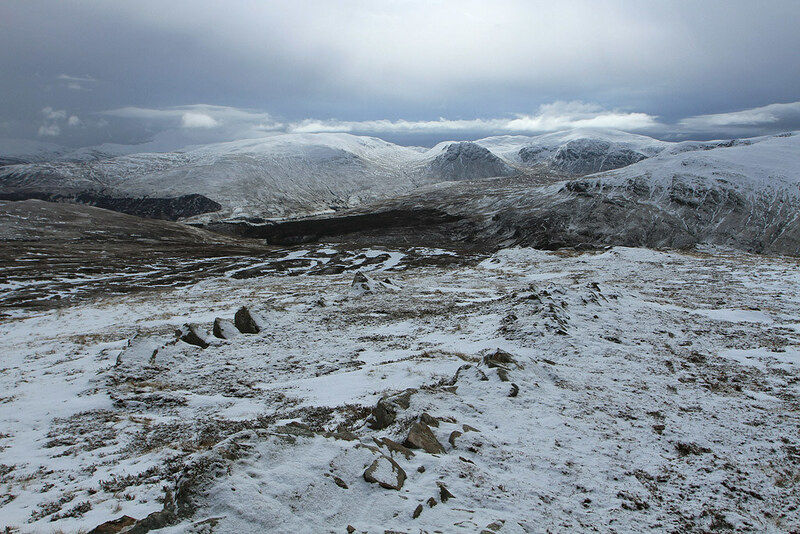 By the time I got changed and started heading back down Glen Lyon the snow was falling steadily and it got heavier as I reached Loch Tay. Thankfully it turned to rain later when I met up with my friends in Killin to finish of a rather nice day .